Subject of speculation, myth, and wonderment for more generations than we can imagine, the Great Sphinx sits complacently, content with its daily appointment with the rising sun. Being finally face to face with the Sphinx is a moment Pam and I had dreamt about all our lives and when it finally came we were not disappointed. Having entered the site from the Sphinx entrance, we approached it from the most advantageous direction. Being in the presence of this, possibly the oldest human construction in the world, is ... moving. Although the Sphinx is visible throughout, the layout of the site leads one first to the Valley Temple just south-east of the Sphinx. It is a small temple and based on superficial characteristics, unimpressive. 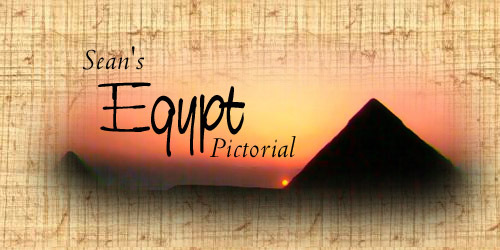 However, there are several characteristics that make it unique in Egypt. As can be seen in the above pictures, the size of the blocks used to build the temple are enormous, some well over 100 tons. Only here are stones of this size used consistently throughout the construction of a temple.1 Larger blocks have been used in other constructions, especially obelisks; the mystery in this case is how they were moved and positioned. Egyptologists without an engineering background tend to throw more and more labourers into the equation proportional to the size of the stone but in this case we have to wonder, "Where would all those labourers fit??" The temple is tiny and it is impossible to imagine how the requisite number of men could manouever these massive blocks into place with the precision exhibited in the space provided using simple lever techniques. It is traditionally accepted that the Valley Temple was built by Chefren (as is the Sphinx); however, another unique feature of the Temple is that it has a core masonry of limestone dressed by granite facing stones. In many cases the dressing stones have had to be intricately shaped to fit weathering on the core stones. When taken in conjunction with the dating issues discussed below, it seems clear that pharaohs of later dynasties have repaired and renovated a much earlier structure. A recurring theme in Egyptian architecture is illustrated magnificently in the picture above. The Egyptians tended to shy away from simple block construction and opted for an astronomically more difficult "jigsaw" construction. Above is a detail of one of the corners in the temple; you can see how the corner is carved into the blocks themselves preventing any break in the flow of the wall. Considering that it provides no structural advantage and is insanely more difficult, it seems clear that this sort of construction held a great symbolic meaning to the Egyptians. Schwaller de Lubicz, the father of the symbolist view of ancient Egypt, believes that it maintains the flow (or perceived flow) of organic energy in the temple and asserts that not only were the temples houses of cosmic deities and forces, but also embodiments of them. "Jigsaw Construction" is not unique to Giza either - it is evident in every construction from every period, especially in corners. Another good example can be seen in these paving stones at Abusir. 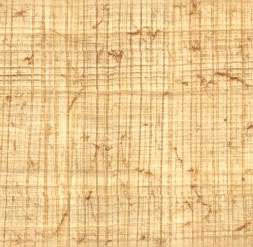 In addition, between every two adjacent stones in a temple, there is at least one "tenon", a bow-tie-shaped piece of wood. Apparently this serves the same function; to provide a symbolic link between the stones bridging the break between them that would otherwise impede the harmony of the construction. This one of the most famous angles, partly because of the inclusion of the Great Pyramid behind and it immediately brings to mind the issue of resemblance. One of the traditional pieces of "evidence" that the Sphinx was commissioned by Chefren is its supposed resemblance to a statue of Chefren. Researchers have gone as far as to develope computer models to objectively measure their similarity. Unfortunately, the models have been shown to be inherently biased and could have been used to demonstrate the Sphinx's resemblance to Elvis with equal precision. 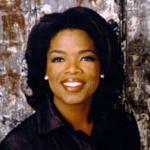 Personally, I think that the Sphinx looks like Oprah. But seriously. This is the kind of evidence that traditional Egyptologists cling to (ok, to be fair, there is other circumstantial evidence) in the face overwhelming evidence to the contrary from other disciplines. By far the most significant piece of evidence that the traditional dating of the Sphinx is not correct comes from geology. 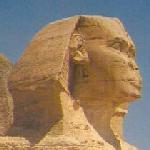 Schwaller de Lubicz first noted that the weathering on the Sphinx could not have been caused by wind or sand - only water. This has since been conclusively shown. The implications of this fact are far reaching and necessitate the revision of human history as we know it - for the weathering to have occurred, the Sphinx would have had to have been sculpted around 10,000 B.C., about 5,000 years earlier than the earliest estimates of the origin of human civilization. It's clear to see why scholars are in general reticent to accept this re-dating, but... let's face the facts. Further evidence for this redating comes from the relatively new discipline of "Archeo-Astronomy" - the study of complex astronomical information that is incontrovertibly encoded in ancient structures all over the world. The evidence is far, far, too involved to discuss here but there are a number of excellent discussions readily available.2 The conclusion? That despite the claims that Egyptologists make, we are still very far from understanding Egypt and our own origins. But before we get mired down in hypotheses, theories, and controversy, lets just take the Sphinx at face value and look at it for what it is in the present; a sculpture of unparalleled beauty and power. The picture on the far right is taken from the outcropping of rock on the south side of the plateau that is visible in the other two pictures. Ok, back to the controversial stuff. Obviously more research is needed - indeed researchers like Graham Hancock and Robert Bauval, have outlined clear proposals that could conclusively support or deny many of the claims that they have made, particularly with respect to the Sphinx. Their analysis of the Pyramid Texts3 suggests that there are ancient structures beneath the Sphinx that further excavations might uncover. Many of the methods they suggest for exploring this possibility are completely non-invasive and yet have been rejected over and over again by the agencies in control of research on the plateau. When one is actually standing in front of the Sphinx, it becomes very clear why this has been so. Any sort of excavations in the area of the Sphinx would severly compromise the "Sound and Light Show" - a trite tourist attraction and major source of income. As well, the area immediately around the Sphinx now sports a spiffy new boardwalk that clearly indicates there is absolutely no intention of performing any sort of excavation in the near future. the Sphinx is undergoing extensive restoration. Although it is admirable that funds are being directed to restoration - indeed I'd love to see the Pyramids themselves returned to their original glory - the restoration is merrily covering up the geological evidence that is the strongest reason for questioning the dating of the Sphinx. It would be a real tragedy if by covering up the evidence, the theory itself ends up being suppressed. The Sound and Light Show... There's a story in and of itself, best told, I think by excerpts from our journals. "There's a big ol' 'Sound and Light' Show at the Sphinx and the Pyramids every night, three times a night in a variety of languages. Yes, that's right, you can smell the cheeze already, but hey it has to be seen! "We left at about 7:30 thinking that we'd get there in time to see sunset and the the show. Unfortunately, we seemed to have gotten a mentally handicapped cab driver. "Alright, to be fair, the man didn't speak English at all and yes it's easy enough to get confused between 'The Sphinx' and 'Sphinx Square'. But once we arrived in Sphinx Square and that was clearly not where we wanted to be you might have made the connection to THE Sphinx. No. So we explain... 'Sphinx.' He responds, 'Sfinkes?' (the word's the same in Arabic except for that little 'es' bit) 'Yes, Sfinkes.' 'Sfinkes?!' 'Yes! Sfinkes!' and then a shrug like, 'I don't know WHERE the hell these foreigners want to go.' So we try another tactic. 'Pyramid. Sphinx.' (appropriate gestures) 'You know. Haram. (the Arabic word for Pyramid) Giza.' 'Haram?! Giza?!' 'Yes!' Shrug. He calls for help - some passerby that speaks a little more English. We explain. Our saviour explains. The driver flashes a black-toothed smile, and takes off. FINALLY, we think. No such luck. It took a total of four more 'saviours' to get us where we wanted to go - one of whom spoke no more English than the driver and tried to speak to us in Arabic, another who was in the car next to us while we were travelling at 80 km/hr, and the gas station attendant where we had to stop for gas! At one point we even pulled out a map of the Giza plateau and started pointing. At least he didn't have the gall to start quibbling over the bill." Well we made it in time for the show, but not for the sunset. "The Sound and Light Show costs LE33 to get into, so we took the advice of the guide book and found a convenient wall to sit on to watch it for free. And then a guard came along and chased us away. So we went to the wall on the far side of the lot and climbed it. The guard chased us off of that too. After that we stood and watched but the view wasn't as good. Anyway, the lighting of the pyramids was very dramatic and moving, as was most of the music. The narration completely sucked, however; it was cheesy, over-acted, and completely wandered off the subject towards the end. Still, the pyramids, blood red against the dark blue sky with the moon overhead was a thrilling and spine-tingling site (sic). I could only imagine how it must've been a thousand years ago, with out the light poles, walls, guard shacks, and screaming Arabic kids playing soccer in the background as a distraction. Of course there wouldn't have been the dramatic lighting then, either..."
Even I will admit that the lighting is pretty impressive. But, I much prefer the natural light show given every night - the sunset. "We ate dinner at the Pizza Hut that the Sphinx is doomed to stare at, and then we walked through the Islamic cemetary and up a hillside to find a vantage point from which to watch the sunset in relative peace and quiet. True to the nature of Egypt, we were continually pestered, and finally chased off the cliff, all because of the stupid Sound and Light show. You cannot just sit and watch the sun go down at the pyramids anymore, even from the desert. It just so perfectly underscores the whole theme of economic exploitation that modern Egypt holds towards ancient Egpyt. It is annoying and frustrating. Dejectedly, we went back to the hotel." This incident was our final visit to the plateau on the last night of our trip. As you might have gleaned, by that time we were beginning to feel a little cynical. 1. This may, in fact, not be true. The Osierion at Abydos shares a number of the characteristics of the Valley Temple - more information will follow in the appropriate chapter. 2. I reccomend: Hancock, Graham, Fingerprints of the Gods; Bauval, Robert and Adrian Gilbert, The Orion Mystery; and Bauval, Robert and Graham Hancock, Keeper of Genesis - in that order. 3. The oldest known version of Egyptian Funerary texts inscribed on the walls of the Pyramid of Unas at Saqqara.